Interested in learning how to cook your own Hip Asian Comfort Food? Join us every month for cooking classes at Blue Bamboo! With a new theme every month, take a journey through the world of cooking as you learn to prepare a traditional Asian dish. 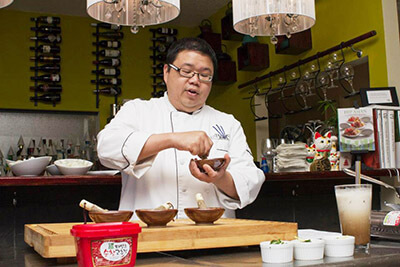 Along with cooking instructions, Chef Dennis Chan loves to share anecdotes from his days as a Culinary Institute of America student, share secrets, and explain the science of cooking with his students. Classes capped at 50 guests – don’t delay, and reserve today! Reserve your spot by calling 904-646-1478. Interested in private cooking classes? At Blue Bamboo, we offer private cooking classes to groups of ten or more. In-home classes are $2500 for up to 10 people. Private classes at Blue Bamboo in the evening are $1500 for up to 10 people. Private classes at Blue Bamboo during daytime hours are $850 for up to 10 people.